"The U.S. military role will not include intelligence sharing with the Russians," Dunford told lawmakers on the Senate Armed Services Committee at a hearing on U.S. national security challenges and ongoing military operations. "I do not believe it would be a good idea to share intelligence with the Russians." The comments by the highest-ranking military officer Thursday morning are out of step with the Obama administration’s latest efforts to solve the years-long civil war in Syria, which involve cooperating with Moscow given the success of a cessation of hostilities. The Obama administration’s agreement with Russia, announced on Sept. 9 by Secretary of State John Kerry and his Russian counterpart Sergey Lavrov, would involve the United States and Russia working together to develop military strikes against Nusrah, the al Qaeda affiliate in Syria, and the Islamic State given a sustained period of reduced violence. The United States and Russia also agreed to share information to establish a "Joint Implementation Center" to cooperate in targeting terror groups. Open-source reporting has cited Kerry’s efforts to cement a deal with Russia involving military cooperation and intelligence sharing on Syria in the event of a successful ceasefire, which has faltered in recent days. The planned cooperation between the United States and Russia has been subject to criticism, given Moscow’s goal of propping up Syrian President Bashar al-Assad and targeting of U.S.-backed rebels under the guise of combating ISIS. The hearing took place days after a suspected Russian airstrike hit a U.N. aid convoy near Aleppo, killing 20 people, after the Syrian military declared the ceasefire to be over. Dunford acknowledged that the agreement meant to staunch violence in Syria seemed to be failing. When asked whether the cessation of hostilities was holding, he said, "That would not appear to be the case over the last 48 hours." Defense Secretary Ash Carter said during testimony that the "behavior we have seen from Russia and Syria over the last few days has been deeply problematic." The State Department said Tuesday the ceasefire was "very fragile" but had not collapsed. Neither Carter nor Dunford would say whether Russian or Syrian warplanes bombed the aid convoy on Monday, though they both held Moscow responsible for the fatalities. The Joint Chiefs chair said his "judgement" led him to believe that Russian planes carried out the strike but that the facts are not certain. Both officials were grilled by lawmakers on the Obama administration’s policy in Syria, which has fallen short of delivering a political solution to a conflict that has killed at least 400,000 people and displaced millions. Dunford estimated Thursday that Assad will remain in power beyond President Obama’s final day in office. "He is surely not leaving in the short term," Dunford said of the Syrian president. Russia and its involvement in Syria took center stage during the hearing, with Dunford labeling Moscow the "most significant challenge" posed to U.S. national interests. "When I look at Russia’s nuclear capability, when I look at their cyber capability, when I look at their developments in undersea warfare, when I look at their patterns of operations—how often they’re operating, the locations they are operating in—these are kinds of operations that we haven’t seen in over 20 years," Dunford said. "When I look at Mr. [Vladimir] Putin’s activities in Ukraine, in Crimea, in Georgia, that causes me to say that a combination of their behavior as well as their military capability … would cause me to believe that they pose the most significant challenge, potentially the most significant threat, to our national interests," he said. In response to inquiries about the increasing cyber threat from Moscow, Dunford said that the Joint Chiefs are currently in the process of rewriting "a more broad framework to deal with Russia and contingencies associated with Russia" to address a full range of hostile behavior, including cyber warfare. 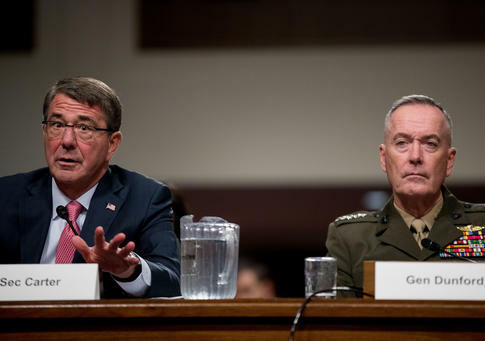 Both Dunford and Carter used their opening statements to emphasize threats to the future force posed by budgetary cuts and uncertainty, which was the subject of a committee hearing last week that featured all four service chiefs. This entry was posted in National Security and tagged Armed Services Committee, Ash Carter, Intelligence, Joseph Dunford, Russia, Syria. Bookmark the permalink.